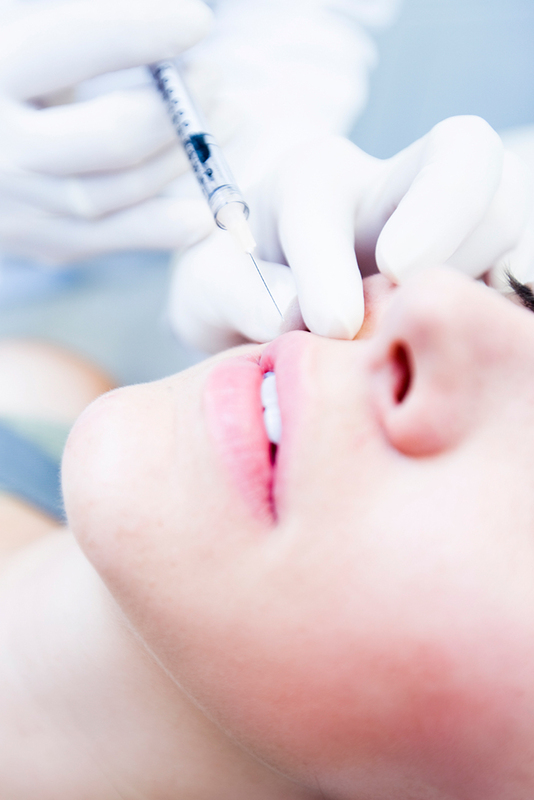 Click the links below to see more information about each of our Dermal Filler procedures. Fat can be used as a filler for reversing the signs of aging and lifting wrinkles. Fat transfer is a safe natural, non allergic procedure that uses your body’s own fat to add volume back to the face. Fat is harvested from a donor site and can be reinjected into facial areas-cheeks, chin, jawline, nasolabial folds, temples, lips and scars. A fat harvest is an in office procedure under local anesthesia, where fat is removed from an area of excess. The procedure takes one hour and medical clearance is needed. Additionally, we recommend arnica and bromeline pre-op for three days prior. Hips, abdomen, legs are common fat donor sites. After the fat is removed, it is then injected into the areas to be treated. The procedure takes one hour and medical clearance is needed. The treated area is immediately swollen after injections. Bruising can also occur which resolves in about a week. Multiple injections are needed over time and spaced 4-8 weeks apart. Once grafted, fat can last up to two years. Areas to be treated can include hollow cheeks, lines around the mouth and chin, acne scars, traumatic scars, and hands. Using your own fat is a wonderful filler alternative. Juvéderm injectable gel is a hyaluronic acid dermal filler that helps to instantly restore your skin’s volume and smooth away facial wrinkles and folds. Hyaluronic acid (HA) is a naturally occurring molecule. Its primary function is to bind and absorb water, which creates volume in the face. As you age, the amount of HA reduces in your skin. The lack of HA causes your skin to lose structure and volume, creating unwanted facial wrinkles and folds. Using a fine needle, Juvéderm XC under the skin to fill the soft tissue of the dermis. This adds volume and diminishes the appearance of wrinkles and nasolabial folds instantly. Longevity varies depending on the area injected. Juvéderm XC uses a manufacturing process called HYLACROSS technology. HYLACROSS gives Juvéderm XC its special smooth-gel structure that holds up over time. Some patients need additional volume in their cheeks for lifting. Juvéderm Voluma XC injectable gel is the first and only filler FDA-approved to instantly add volume to the cheek area. It gives you a subtle lift, helping to restore contour. Juvéderm Voluma satisfies a need for volumizing the cheeks to restore support for the lower face in addition to the upper face. Most side effects are mild or moderate in nature, and their duration is short lasting (7 days or less). The most common side effects include, but are not limited to, temporary injection site reactions such as redness, pain/tenderness, firmness, swelling, lumps/bumps, bruising, itching, and discoloration. As with all skin injection procedures, there is a risk of infection. VOLBELLA® XC is a soft, smooth gel appropriate for adding subtle volume to the lips and softening the appearance of perioral lines. Volbella is new for 2017 and from the Juvederm family. Volbella is considered a more subtle filler special for the lips. It is formulated with Allergan’s proprietary VYCROSS® technology, and gives a smooth finish. Hyaluronic acid is a naturally occurring substance in your skin that helps provide fullness and elasticity. Hyaluronic acid diminishes as we age, causing skin to lose volume while increasing the chances for wrinkles and folds to appear. Restylane is a hyaluronic acid dermal filler. Its primary function is to bind and absorb water, which creates volume in the face. Young, healthy-looking skin contains an abundance of a hyaluronic acid (HA). As you age, the amount of HA reduces in your skin. The lack of HA causes your skin to lose structure and volume, creating unwanted facial wrinkles and folds. Restylane Lyft (formerly called Perlane) is more concentrated, and offers beautiful enhancement for additional areas of the face — the lips, the chin line, the cheeks, around the mouth and eyes, and very deep folds between the lips and nose. Perlane is used over Resytlane to correct deeper wrinkles and give more volume lifting. Perlane has larger average size particles than Restylane and is injectioned deeper into the skin. The lips and the lines around the mouth, like other areas of the face, show signs of aging as you get older. This often results in lip thinning, lost shape and an increase in vertical lines above the lip. Restylane Silk is designed specifically to provide natural-looking results in these particular areas by using smaller, smoother hyaluronic acid particles than those used in other Restylane® products. Restylane® Silk was the first FDA-approved product specifically designed for lip augmentation and the smoothing of wrinkles around the mouth in patients 21 years of age and older. Belotero Balance Dermal Filler is a different type of filler specially designed to integrate into your skin and mold to your distinct facial contours. By adapting to the individuality of your skin, it softens lines and wrinkles around the nose and mouth for smooth and natural results. Belotero is an injectable hyaluronic acid gel with different properties that allow it to adapt within the skin for soft and even correction. It can be injected into fine wrinkles yet the versatility of the product makes it strong enough to handle many treatment areas such as: nasolabial folds (smile lines around the mouth) and delicate areas such as vertical lip lines (thin lines that appear above the lip line) and tear trough (under eye area). After any injection, you may experience mild irritation, swelling, itching, redness, bruising or tenderness at the injection site. These side effects typically resolve on their own. The results typically last four to six months. Sculptra Aesthetic is made of a synthetic material called poly-L-lactic acid, which works to replace lost collagen. Poly-L-lactic acid is safe — absorbed naturally by the body — and has been used for years in dissolvable stitches. When injected, it adds volume to larger areas of the face. Sculptra is especially useful for patients with thin faces, or who have lost much of their cheek fat due to extreme fitness, genetics, medications, or other reasons. Sculptra Aesthetic is suitable for: deep folds between the nose and the mouth (nasolabial folds) also called smile lines, the lines framing your mouth (marionette lines) and chin wrinkles. It can also be used in the back of hands for aging, in the upper chest for deep lines, in areas of depressions, and for cosmetic correction of scars. The Poly-L-lactic acid particles stimulate the formation of new collagen in the skin, adding volume over time. As you age, your body’s collagen production decreases, and you may begin to see wrinkles. The Poly-L-lactic acid particles stimulate the formation of new collagen in the skin, adding volume over time. Within the deep dermis, your skin’s structure is reinforced as Sculptra Aesthetic helps to replace lost collagen. This reinforced collagen structure provides a foundation that gradually restores the look of fullness of your shallow to deep facial wrinkles and folds that has been depleted over time. It requires multiple treatment sessions spaced 2-3 months apart. Improvement is gradual over 6 months but provides a more youthful looking appearance that can last more than two years. You should not use Sculptra Aesthetic if you are allergic to any ingredient of the product or have a history of keloid formation or hypertrophic scarring. It should not be injected while you have an active skin infection or inflammation in the treatment area and should not be injected into the red area of the lip. Side effects may include injection site discomfort, redness, bruising, bleeding, itching and swelling. Other side effects may include small lumps under the skin that are sometimes noticeable when pressing on the treated area. After injections, patients are instructed to massage the area multiple times a day and for a few days. Radiesse is a synthetic dermal filler made of calcium hydroxylapatite. When injected into the deep dermis and subcutis, Radiesse acts as a scaffold under the skin providing structure and stimulating your own collagen to grow. This natural collagen continues for several months. The results are immediate correction and long lasting. It is used for soft tissue augmentation and can help to fill in deep skin folds and wrinkles. It is helpful for jawline definition, chin, cheek augmentation, temple augmentation, and even in the hands. The effects of a Radiesse treatment can last six months to one year. Immediately after injection, the areas will be iced for 15 minutes. There is no exercise for the rest of the day and no dental work for two weeks. It is normal after injections to have temporary bruising and swelling that can last a week.